I earned my I.F.B.B. professional fitness status at the 2000 NPC Team Universe Championships. I am currently training for all of the I.F.B.B. professional fitness shows in the year 2002----wish me luck! My involvement in bodybuilding and fitness stems from a thirteen year elite-level career in gymnastics. I attended Chantilly High School, where I was a member of the internationally recognized show choir that was voted first in the nation by Downbeat magazine. I was a member of the gifted and talented program, where I tied with another woman for the prestigious title of Valedictorian, closing a four-year secondary school career with over a 4.0 GPA. I then accepted a vocal scholarship at the University of Virginia, where I studied Molecular Biology, Music with a specialization in Vocal Performance, and the Spanish language. I completed three years at the University of Virginia before transferring to George Mason University, where I completed a double major in Molecular Biology and Music, and a minor in Spanish. I finished my master's degree in molecular biology at George Mason University in August of 2000. 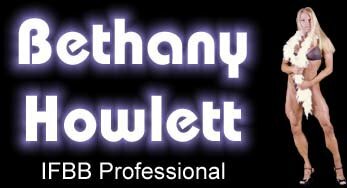 For more background information on Bethany Howlett, check out her web site @ www.bethanyhowlett.com/! Job: Owner/Founder: Better Bodies By Bethany, Inc. The Real Skinny On Fat Burning Compounds! As the ban of ephedra takes action in all nifty fifty United States severe exercise enthusiasts are desperately seeking an aid to help accelerate body fat loss. IFBB Pro Bethany Howlett shares some of her tasty, healthy recipes! Choice Recipes: Beef Taco Salad!